Our Social Sharing Kiosk doubles the fun by allowing your guests to share their pictures on Facebook, Twitter, Pinterest, Instagram, and by text message and email. At Forever Captured Photo Booth we’ve built more ways to capture fun and memories into every photo booth rental with our Social Sharing Kiosk. 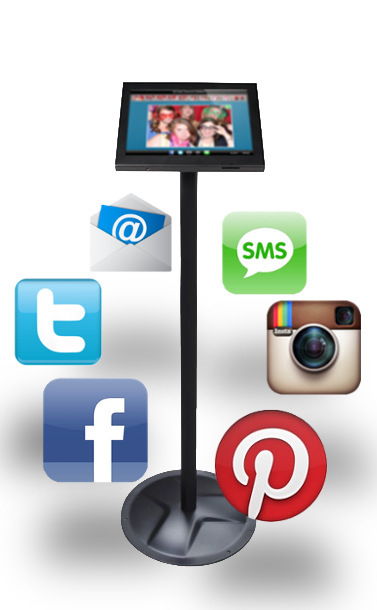 It’s a touch screen on a stand that wirelessly communicates with our photo booth, grabs all the pictures being taken, and allows each one of your guests to share their best photo booth pictures with friends on Facebook, Twitter, Pinterest, Instagram, or even as a text message or email. It really amps up the fun and allows your guests to share their laughs and excitement with all their friends. While our photo booth is smart enough to let people share their pictures on social media, we found this created a line-up for the photo booth. Our solution was to create the small kiosk you see on this page using state-of-the-art software and an intuitive touch screen. 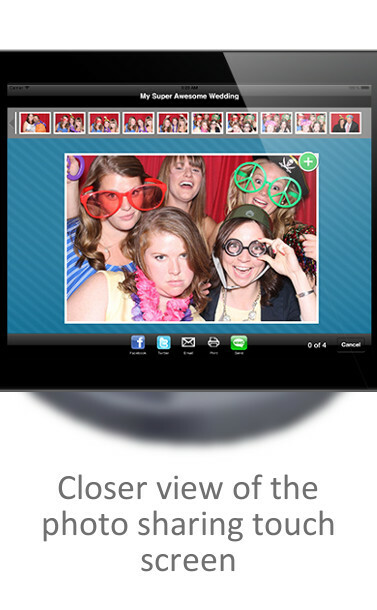 This actually worked out far better than we initially thought because it doubles the fun by creating another fun thing for people to do at your event by allowing guests to find their pictures, share their funniest ones with all their friends, and see their friends’ reactions as they respond and comment on social media. Once your event is over, your guests leave with awesome photo booth photo strips in hand as party favors and great pictures online to remember your event by. For your guest who don’t get around to sharing their pictures on the social media kiosk, we always provide an online gallery after each event so all your guests can have the opportunity to download or share their pictures after the event is over (your photo gallery can either be public or private, it’s your choice).